4 Easy Dips Paired with 4 Beers – Buffalo Chicken Dip with Blue Moon Mango Wheat, Taco Dip with Sol, Bacon Ranch Dip with Coors Banquet, and Chocolate Candy Bar Dip with Leinenkugel’s Snowdrift Vanilla Porter!! Three savory dips and one sweet dessert dip! FAST, EASY, and guaranteed to be hits at your next party or event!! This is a fun post because today I am showing you how to make four different dips in a matter of no time. So simple, easy-peasy, and I promise these dips will be the hit at your next party of event. Whether it is a girls-night-in or a backyard barbecue or a sports night that you’re hosting, these dips will disappear fast. And of course they make you look like the hostess with the mostess. As we all know, food is more than just nourishment. It’s about having fun, getting together with friends and family, and celebrating life. There are a couple fun twists that all four of these dips have. First – there is a common ingredient in all of them. At first glance from reading the titles you may be inclined to think cheese, and yes, three of the four have cheese. Oh how I love cheese. But the ingredient that ties them all together is cream cheese and who doesn’t love cream cheese. It makes for a really easy dip base and can be used in both savory and sweet dips, as you’ll see here. The second twist that all of these dips have is that they’ve been expertly paired by a Master Cicerone, which is like a Sommelier for beer. 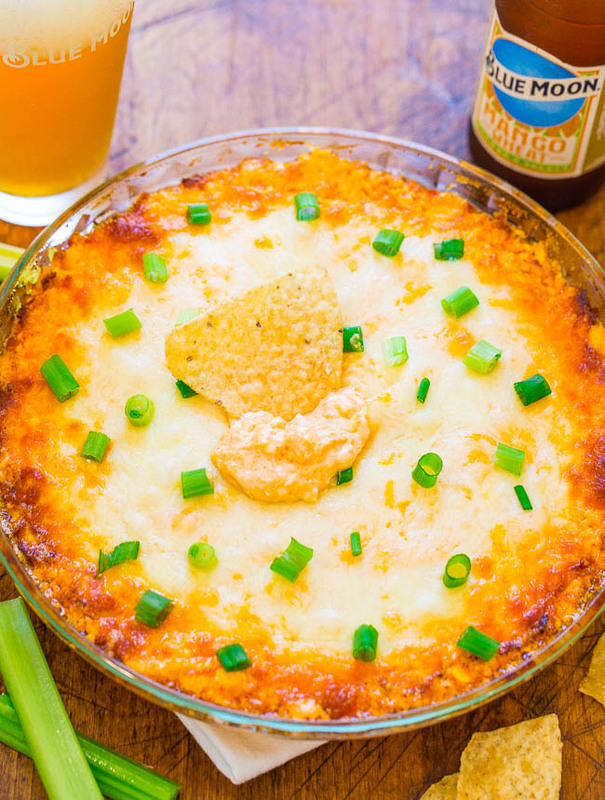 Nothing says bring on the party more than dips that are perfectly paired with beer. For more recipes and pairings, check out Pints and Plates as well as on Pinterest or Instagram using the #pintsandplates hashtag. This is a classic dip sure to be a fan favorite. 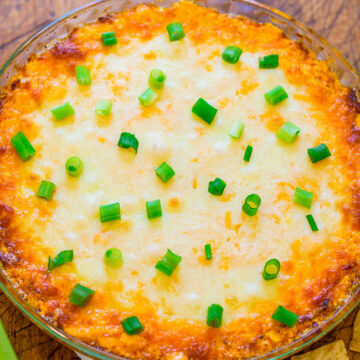 It’s made with our key ingredient, cream cheese, plus shredded chicken, buffalo wing sauce, ranch or blue cheese dressing, sour cream, cheddar and mozzarella cheeses, and green onions. To save on prep time, you could pick up a pre-cooked rotisserie chicken from your local grocery store. To plus up the flavor, it’s paired with Blue Moon® Mango Wheat. 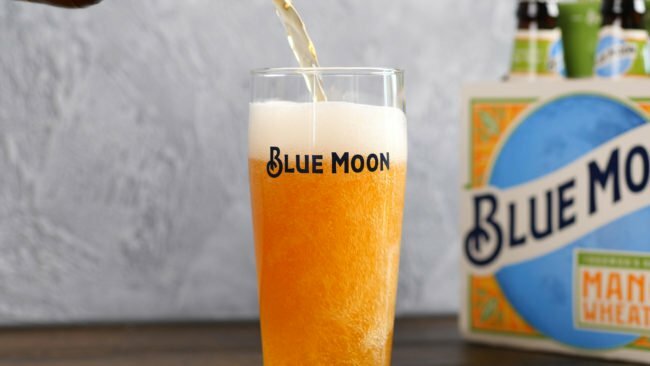 Blue Moon Mango wheat has a sweet creaminess that balances the heat and spicy tang of the buffalo sauce, while the bright tropical mango mingles with the vinegar tang of the sauce to enhance both flavors. The cheese has an incredible gooey factor that’s just irresistible when you dig into it with tortilla or potato chips or celery sticks. I mean look at the streeeeetchy cheese. My heaven right there. 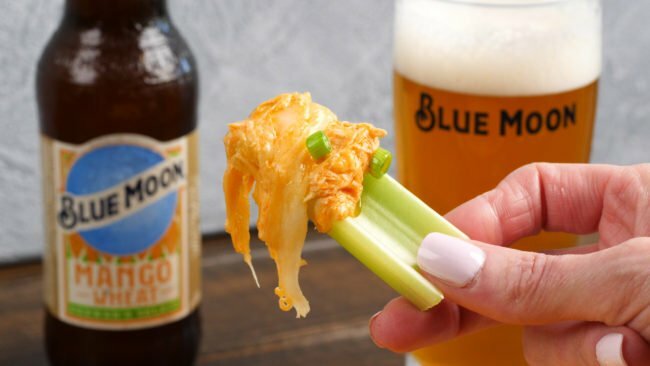 It’s a classic dip that everyone loves and a cold beer like Blue Moon Mango Wheat is the perfect touch. The second dip is inspired by the flavors of Mexico. Start by mixing refried beans with taco seasoning. 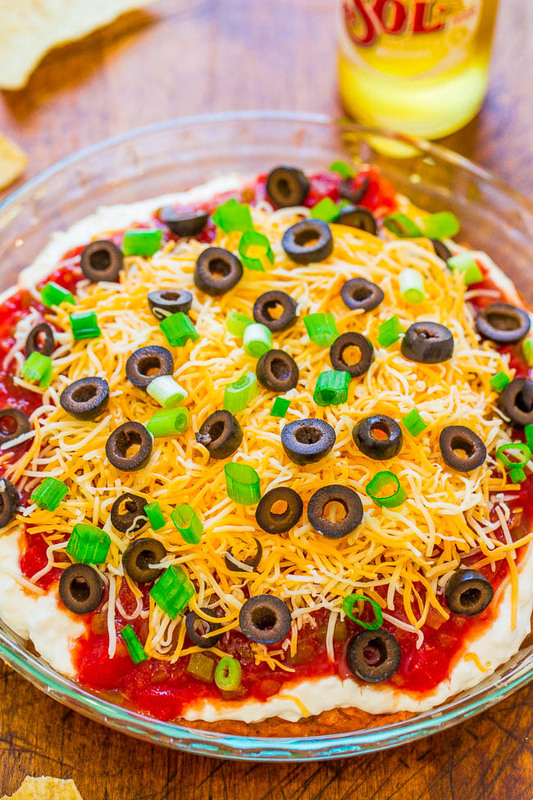 Then, add a layer of cream cheese mixed with sour cream, topped with chunky salsa, cheese, green black olives, and green onions. I used spicy refried beans, medium heat taco seasoning and medium salsa, but feel free to mix and match heat combinations to your liking. Tip – I like to make the subsequent layers just a bit smaller in diameter so that with each successive layer, you can get a glimpse of what’s underneath. 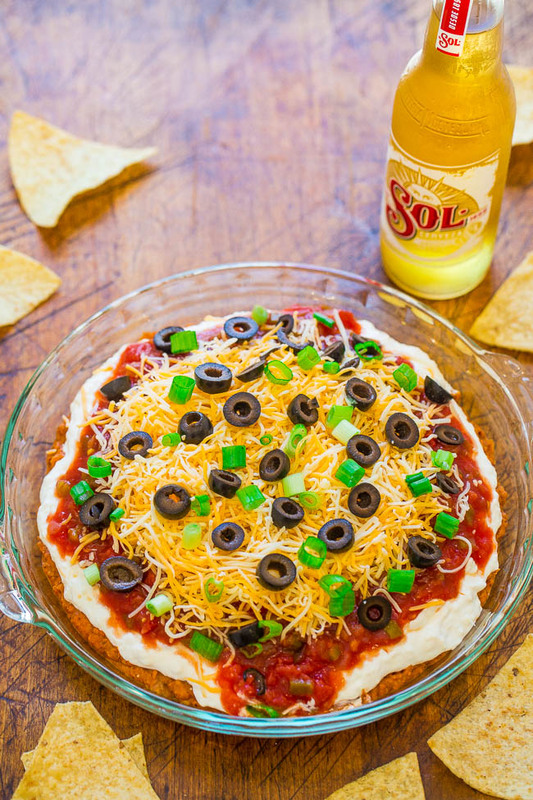 Serve it with tortilla chips and pair it with a great cerveza like Sol. Sol’s bready malt sweetness and light, crisp body balance the rich refried beans and add a refreshing contrast to the salty black olives and tortilla chips. The refreshing carbonation of Sol brightens the dip and cleanses the palate for more. 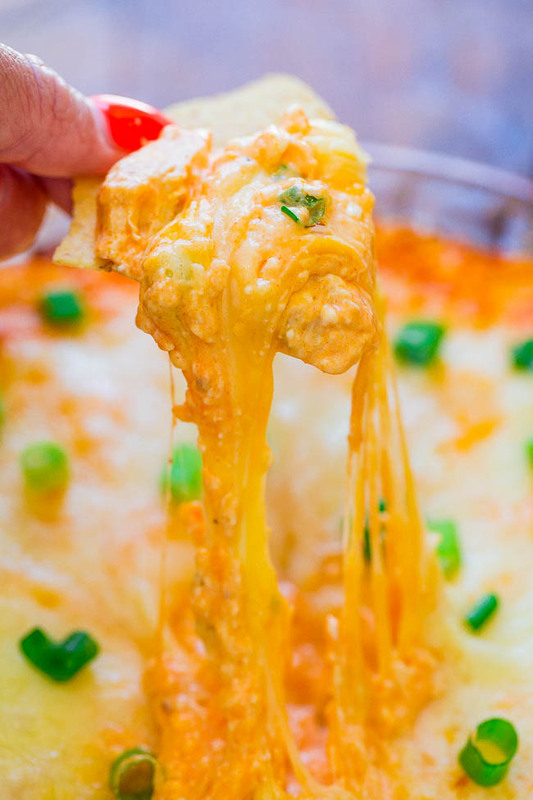 Our next dip is another chilled fan favorite and it’s super easy to make. It’s great to make during the hot summer months when you want to stay cool. Just beat together cream cheese, sour cream, ranch seasoning mix, bacon, green onions, cheese, and voilà, you’re done in less than 5 minutes. Serve it with potato chips on a summer day and pair with a chilled Coors Banquet®. The malty sweetness of Coors Banquet provides a refreshing contrast to the ranch seasoning and salty bacon while complementing the toasted quality of the chips. The carbonation lightens each bite making you crave more. To balance out the savory dips, there’s a deliciously sweet dessert dip. 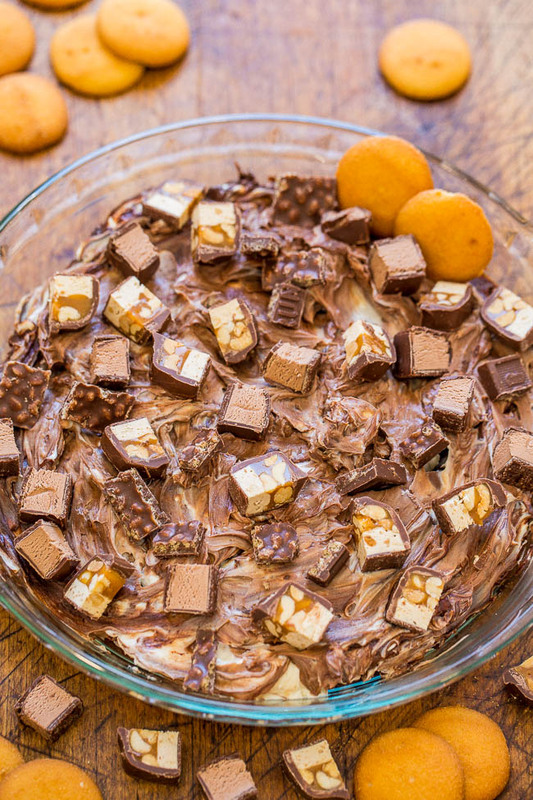 This dip is made with a combination of your favorite diced candy bars. I used candy bars that had caramel and wafer in them, but feel free to use whatever you enjoy. The candy bar pieces are mixed into lightly sweetened cream cheese that’s swirled with melted chocolate. 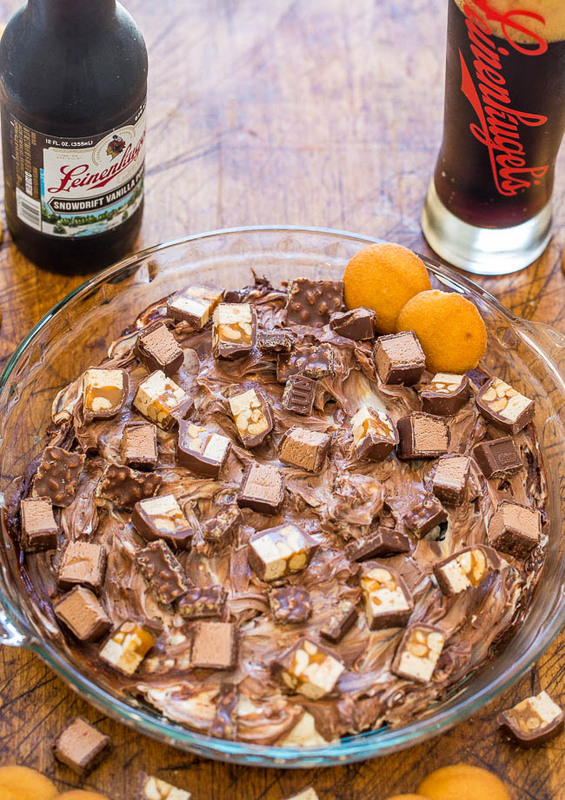 Serve this easy, no-fuss dip with wafers or graham crackers and pair it with a Leinenkugel’s® Snowdrift Vanilla Porter®. The vanilla bean and roasty chocolate notes from the roasted malts in Leinenkugel’s Snowdrift Porter complement the sweet milk chocolate and nutty flavors in the candy while contrasting the salted caramel. The subtle bitterness and carbonation provide balance to this sweet dip. This is another one that’s ready in 5 minutes, making it a perfect dessert for impromptu events. I have a video here demonstrating to make all of the dips. Other than the first dip which takes about 25 minutes to bake, the rest of them are no-bake, no frill dips that everyone is going to gobble up. And when you’re thirsty don’t forget your favorite #pintsandplates beer pairing. 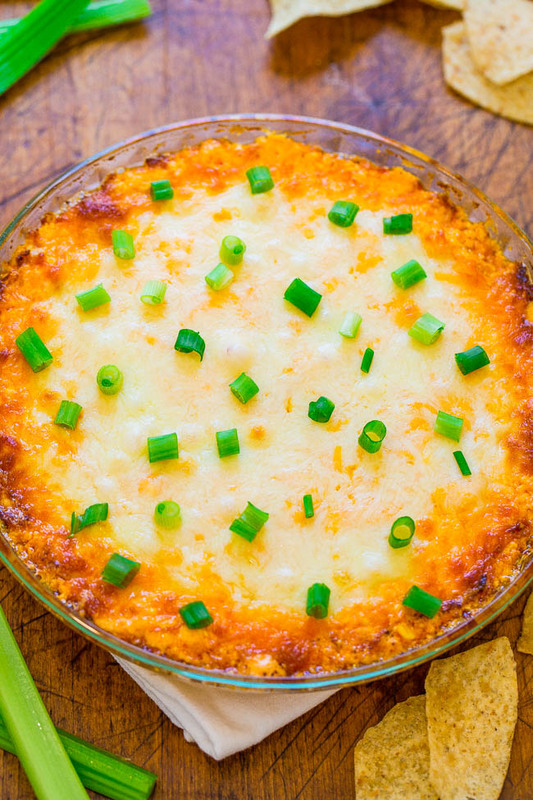 Buffalo Chicken Dip – Preheat oven to 375F and spray a 9-inch pie dish with cooking spray; set aside. To a medium bowl, add the chicken, buffalo sauce, and stir to combine; set aside. To a large bowl, add the cream cheese and beat with a handheld electric mixer until soft and fluffy. Add the mayo, ranch or blue cheese dressing, 3/4 cup cheddar cheese, 3/4 cup mozzarella cheese, and beat to combine. Turn mixture out into prepared pie dish, evenly sprinkle with the remaining 3/4 cup cheddar cheese, remaining 3/4 cup mozzarella cheese, and bake for about 25 minutes or until lightly golden browned around the edges and bubbly. Evenly garnish with green onions before serving with potato or tortilla chips, or celery sticks. Pair with Blue Moon Mango Wheat. Dip is best warm and fresh. Taco Dip – To a medium bowl, add the beans, taco seasoning, and mix with a handheld electric mixer to combine. Turn mixture out into a 9-inch pie dish; set aside. To a medium bowl, add the cream cheese, and beat with a handheld electric mixer until soft and fluffy. Add the sour cream and beat to combine. Turn mixture out over the refried beans in the pie dish. Tip – I like to make the subsequent layers just a bit smaller in diameter so that with each successive layer, you can get a glimpse of what’s underneath. Evenly pour the salsa out over the cream cheese-sour cream layer, evenly sprinkle the cheese, olives, green onions, and either serve immediately with tortilla chips or cover and chill in the fridge for up to 24 hours before serving. Pair with Sol. Dip will keep airtight in the fridge for up to 5 days. 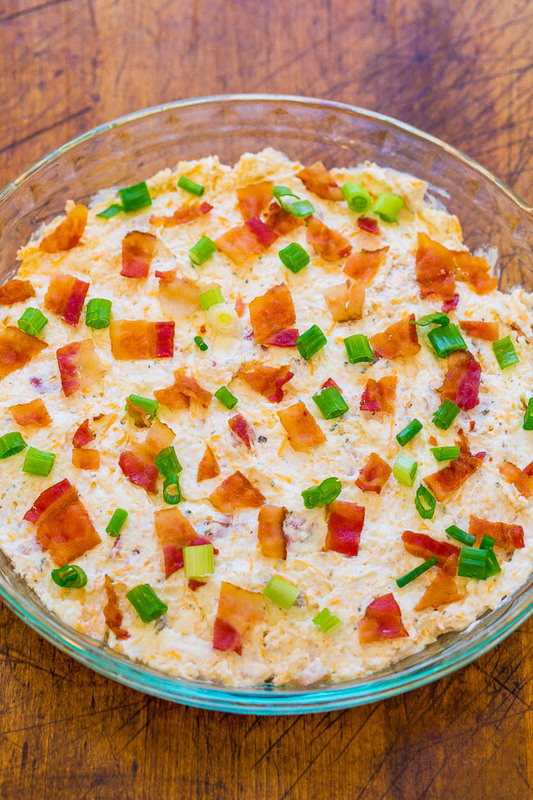 Bacon Ranch Dip – To a large bowl, add the cream cheese, sour cream, ranch seasoning mix, 2 heaping cups cheese, bacon (reserve 2 tablespoons), and mix with a handheld electric mixer to combine. Turn dip out into a 9-inch pie dish or serving bowl. Evenly sprinkle with the reserved bacon and green onions. 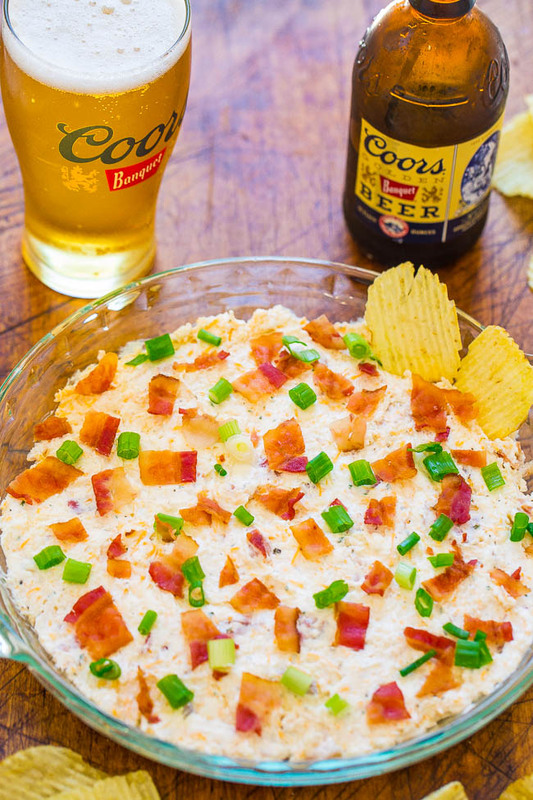 Serve immediately with potato or tortilla chips and pair with Coors Banquet. Dip will keep airtight in the fridge for up to 5 days. 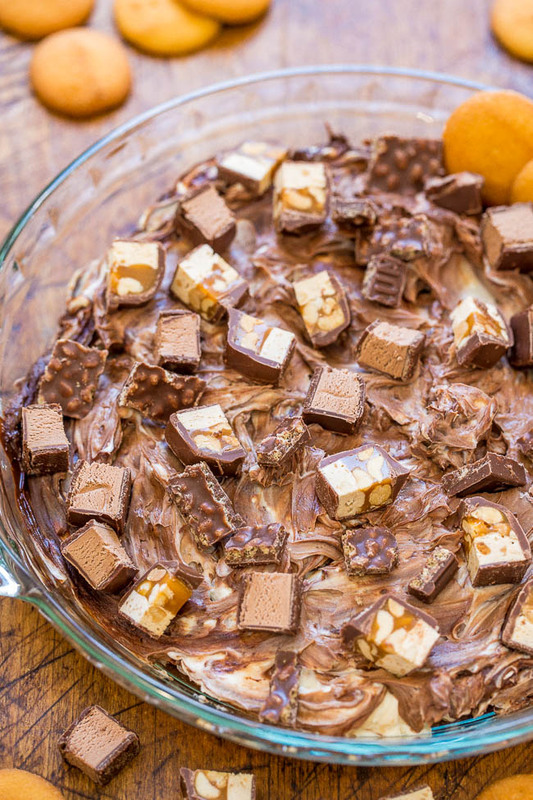 Chocolate Candy Bar Dip – To a medium, microwave-safe bowl, add the chocolate and heat on high power to melt, about 1 minute. Stir until smooth and set aside to cool. To a large bowl, add the cream cheese, confectioners’ sugar, and beat with a handheld electric on medium-high speed until smooth and fluffy; stop to scrape down the sides of the bowl as necessary. Add the vanilla and beat on medium-high speed to incorporate, about 15 seconds. Add 1 heaping cup candy bar pieces, optional salt, and stir by hand to incorporate. Add the cooled milk chocolate and fold lightly to incorporate using a spatula. Don’t overmix if you want to see swirls of white and chocolate. 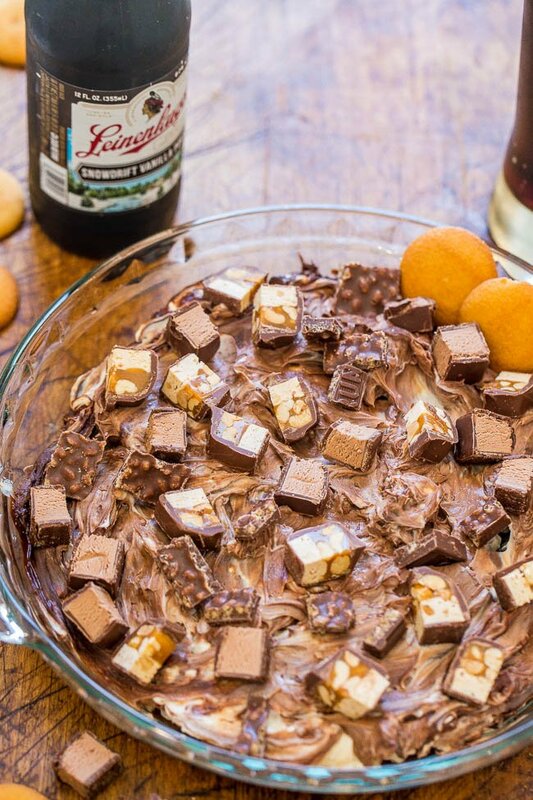 Turn dip out into a 9-inch pie dish, evenly sprinkle with 1/2 cup remaining candy bar pieces, and serve immediately with graham crackers, wafers, etc. or your favorite dippers and pair with Leinenkugel Snowdrift Porter. Dip will keep airtight in the fridge for up to 5 days. Post is brought to you by Miller Coors. The recipes, text, photos, videos, and opinions expressed are my own. Alcohol is only for those for whom it´s appropriate and legal. Always drink responsibly. A fun post for sure–these all look fantastic and so does the beer! It would be hard to pick a favorite but the Buffalo chicken and the chocolate candy bar would certainly be top contenders! They were top contenders for us too! My daughter loved that candy bar dip! I really loved the Taco Dip too because I love all things Mexican! Love these dips, but I love the pairing suggestions even more! The right combo can so enhance the flavors of everything, but I wouldn’t say that I’m good at pairing stuff up. At all, lol. Thanks for making it easy! Glad you love all the dips and the suggestions, too! Have a great weekend! This is perfect for all the summer parties! There is a dip for everyone. I might have to start with the Chocolate Candy Bar. Looks amazing! That’s what the hope was….something for everything! Have a great pre-4th of July holiday weekend!